The property is really just average in every dimension. The amenities (besides the pool) aren't noteworthy and the units are below par except in the kitchens. The location is ok but not super either. Pros include: The kitchens are well done, with the faux hardwood flooring, all black appliances and darker cabinets. The courtyard is lovely and peaceful and is the most outstanding facet about the property. On the down side, the closet space is very linited and the bathrooms are terribly small. In general, the floor plans are divided poorly and in odd configurations that do not utilize the space properly. Tips: Units come with a free 40 inch plasma TV. Green Leaf Vista is located in a quiet east Mesa neighborhood. It is a 5-10 minute drive to Highway 60. There are grocery stores and a gas station within easy walking distance, but this property is better suited for those willing to drive. Green Leaf Vista is a lovely community located in a quiet east Mesa neighborhood. 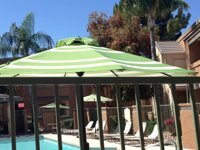 This property offers a lovely pool in a relaxing courtyard setting, in addition to a clubhouse and fitness center. The units feature faux hardwood flooring, all black appliances and dark cabinets. Need more variety in your apartment search? Give our Mesa apartment finder another try and change up your filter.